Your plants grow in garden soil, but have you ever wondered what soil really is? It’s a combination of rock particles and minerals, organic matter, oxygen, water and micro-organisms. You may even have struggled with heavy clay or excessively sandy soil, but most likely your soil is a mixture of sand, silt and clay, with one predominating. Sand has the largest particles, silt is in the middle, and clay particles are the smallest. 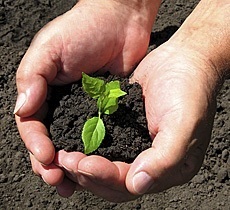 To find out what you’ve got, squeeze a handful of slightly damp soil. If it just falls apart, you likely have sandy soil. If it forms a hard, smooth ball, you’re at the other end of the spectrum with clay soil. If your soil resembles crumbly chocolate cake and is easy to dig, you’ve won the gardener’s equivalent of the lottery: loam soil, which is about 20 per cent clay, 40 per cent sand and 40 per cent silt. Most plants thrive in loamy soil that’s moist but well drained – a seeming contradiction that simply means soil that retains moisture, but doesn’t stay too wet. Garden soils that are very sandy let water to percolate through quickly and dry out fast, which leaches plant nutrients out quickly too. Clay soils are rich in mineral-based elements and nutrients that plants need, but they have the opposite problem: they easily become waterlogged, as vital air pores fill with water. This can kill off soil organisms and injure or destroy plant roots. In nature, forests and grasslands don’t get cut back and raked up; instead, all the dead stuff decomposes into humus, which has many elements that plants need for growth. Humus creates a loose soil structure that holds moisture and air, and drains well. Copy nature by making composting in your backyard (find out more here), or add composted manure or other organic matter, which you can buy at garden centers. Both heavy clay and sandy soils benefit from added humus. With clay soils, humus breaks up the small tight-sticking mineral particles and helps to create larger pore spaces that drain more easily and hold oxygen. With sandy soil, humus acts like a sponge to hold moisture and add fertility. When you’re first creating a flower bed, spread humus, in a layer about 3 inches (8 cm) thick over the soil and dig it in about 8 inches (20 cm) deep. If you don’t want to dig, you don’t have to: just leave the humus on top. For more information on no-dig gardening, you can’t wrong with the book, Weedless Gardening . Click here for more tips on creating a bed without digging.